Arianespace’s ninth launch of 2017 is now scheduled for September 29 on a dual-payload Ariane 5 mission to geostationary transfer orbit with Intelsat 37e (for the global operator Intelsat) and BSAT-4a (for Space Systems Loral in the framework of a turnkey contract for the Japanese operator B-SAT). 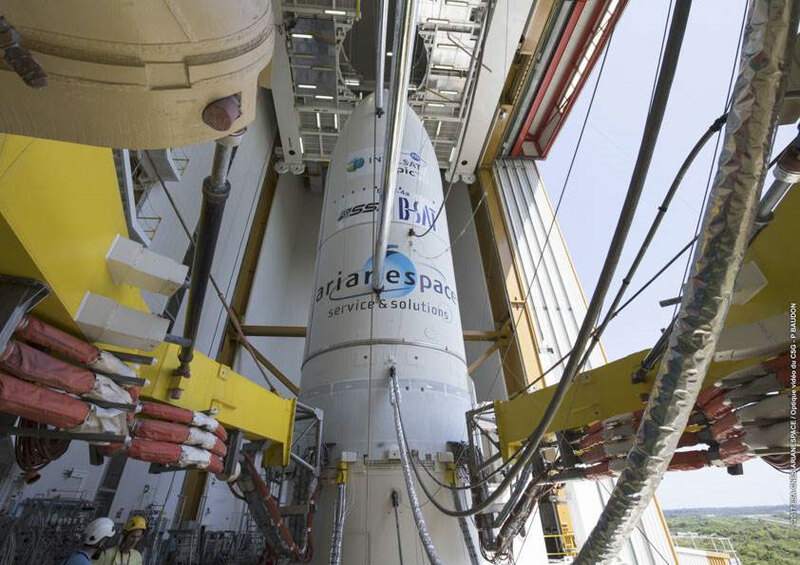 Designated Flight VA239 in Arianespace’s mission numbering system for its launcher family, the liftoff originally had been set for September 5, but was delayed after the countdown was stopped. An anomaly was detected with an electrical component in one of the Ariane 5 launcher’s two solid boosters, which subsequently was replaced – allowing the launch vehicle’s return to flight status. Intelsat 37e will be the fourth EpicNG spacecraft orbited by Arianespace to date. Built by Boeing based on the 702MP platform, Intelsat 37e is the first satellite to offer interconnectivity between three different bands. It will deliver high-performance service in C-, Ku- and Ka-bands for use in wireless backhaul, enterprise VSAT and mobility networks. Flight VA239’s BSAT-4a satellite passenger will be utilized by B-SAT for Direct-to-Home (DTH) television service in Japan. Based on Space Systems Loral’s SSL 1300 platform, BSAT-4a is equipped with 24 Ku-band transponders and will expand the availability of advanced television services such as high definition and 4K/8K ultra-high definition. on Sept. 29 Between 5:47 p.m.
on Sept. 29 Between 11:47 p.m.